We know you love to sell great holidays as much as your customers love to go on them. That’s why serving them with real-time, dynamic content and personalization will be a win-win situation. You make the sales and your customers get to travel the world, so everyone’s happy. 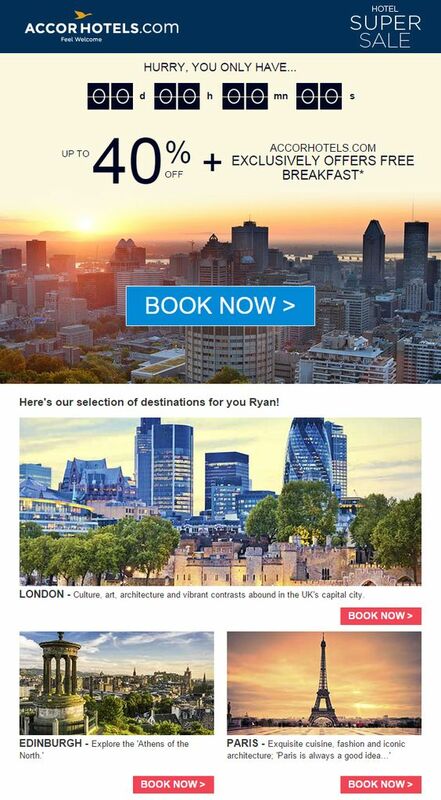 We’ve been looking for some inspiration for your email and web strategy from travel companies that are getting it right! Virgin Trains are showing us all how it’s done in terms of capturing those almost-lost sales! The brand uses Browse Abandonment Emails to bring people who have browsed their website for train tickets back to the website and the tickets they searched for in order to close an increased number of sales. 65% of shopping carts are abandoned, so use Browse and Cart Abandonment Emails to remind those shoppers of what you have to offer, and bring them back to the cart that they almost forgot about. Countdown Timers create a sense of urgency for readers, especially when they’re counting down to the end of an offer or discount. The FOMO that your reader will feel when presented with an offer they only have so long to redeem may be just what they need to give them a gentle push in the direction of completing a purchase. That’s exactly what Accor Hotels have done in this email. By presenting a countdown timer, with an irresistible offer for money off the reader’s holiday, and a CTA to follow straight through to booking, how could the reader not want to take advantage of this offer? Do something similar by partnering your temporary offers with countdown timers in your email and web content. Product recommendations are a great way to personalize your email and web content to grab your reader's attention with holidays and deals that they might like. 45% of online shoppers are more likely to shop on a site that offers personalized recommendations. These holiday package product recommendations from Kahuna are the perfect way to encourage viewers to click-through and consider booking what has been recommended to them by the brand. Use Fresh Relevance Product Recommendations SmartBlocks to apply personalized recommendations in your email and web content and achieve more conversions. According to MarketingSherpa, customer reviews boost clickthrough by 25%, which is why we think it’s important for travel companies to include social proof like customer reviews in email and web content to increase clickthrough rates and convert viewers into customers. 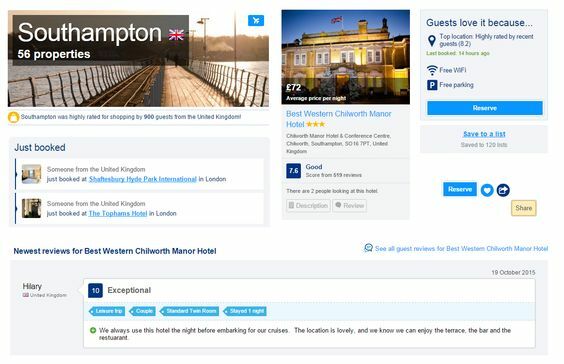 Booking.com uses social proof in its email and web strategy by listing bookings that have just been made with them, showing a star rating on each hotel that uses the business to make bookings, and also presents the “Newest Reviews” for the hotels, including a rating and a written review from previous customers. Using weather features in travel email and web content can really stir up your audience, making them crave the hot beach holiday or the chilly winter stay that they’ve been craving for ages. Hostelworld has used weather in its post-purchase emails to customers preparing for the holiday they’ve purchased with the business to get them excited for their upcoming getaway. Use weather features similarly, or use it to increase clickthroughs and conversions by showing viewers the weather they’re missing out on. Want to make your email and web strategy take flight?